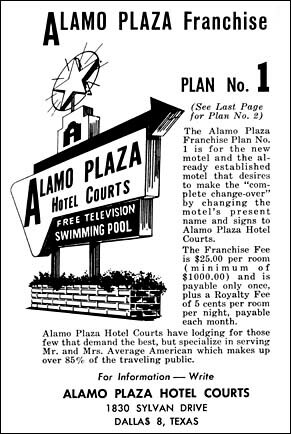 © 2002: The Dallas Plaza and animated "Great Sign"
Well established by the late 1950s, one branch of Alamo Plazas fashioned a franchising program that Lee Torrance tacitly agreed to permit. The scheme was concocted by Bill Farner who had been an early employee of Torrance's and had become owner of several Alamo Plazas including, Baton Rouge, Beaumont, Dallas, Gulfport, and others. The plan was likely inspired by the rush to franchise motels by other hospitality concerns like Howard Johnson's and the upstart Holiday Inn chain. 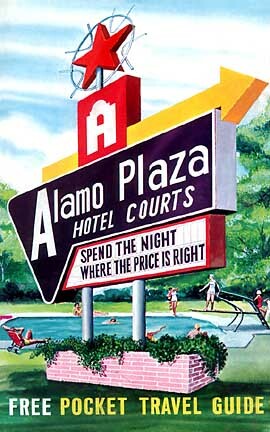 In fact several people have noted the similarity of Alamo Plaza's circa 1959 road sign to Holiday Inn's "Great Sign." However the two-part franchise offering did not follow in Holiday Inn's lead or anyone else's, and it was dropped for a variety of reasons a little more than a year after it had been proposed. 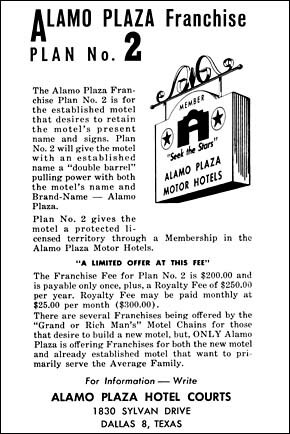 Remarkably fifty Alamo Plazas and Alamo Plaza member motels were signed up and listed in their only directory to promote franchising. Had Farner not abandoned his franchising idea, perhaps more Alamo Plaza signs might have been erected. 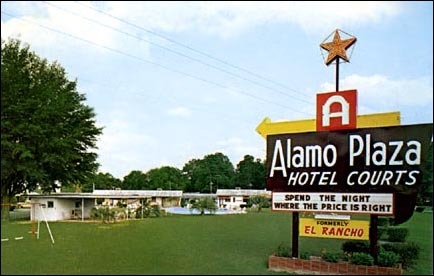 By 1960 the brand had gained enough recognition that it was no longer necessary to build Alamo-looking buildings, rather new logo-signage was devised to represent the brand. Just as the Alamo motif had been repeated in architecture, letterhead, matchbooks, blotters, etc., the new sign-logo replaced the long familiar facade, but it still reminded the public of Texas heritage with a prominent Alamo shaped 'A' and "lone star." Times and styles had changed rendering the Alamo facade outmoded and outdated. 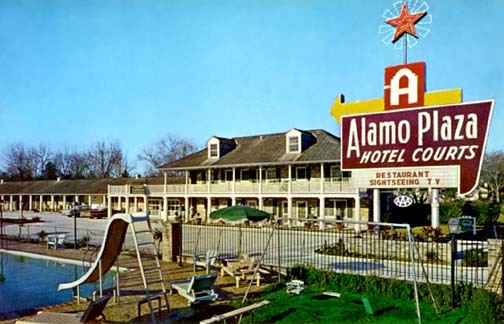 After the original circa 1940 New Orleans Alamo Plaza location on Airline Highway closed and was demolished in the middle 1950s, the Crescent City was without an Alamo Plaza until the Plantation Motor Hotel on Chef Menteur Hwy. was converted during Farner's short attempt to franchise the brand. 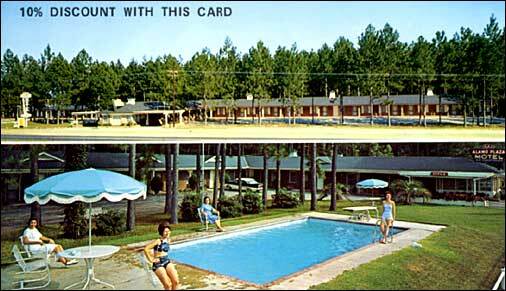 Buying into the franchising scheme, operators in High Springs, Florida converted their motel into an Alamo Plaza. 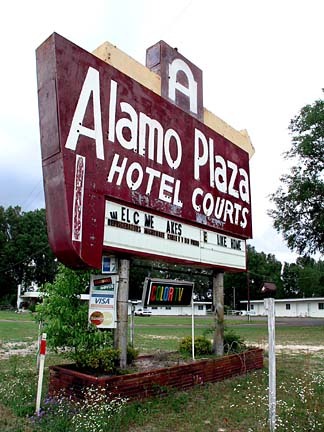 Complete with its Great Sign, the location was shown briefly in a commercial for a Marriott brand in 2004 (its Alamo Plaza name was digitally altered in the advertisement). © 2005: Remains of one of the last "Great Signs"
Not using an Alamo Plaza "Great Sign," the motel below located in Statesboro, Georgia was officially converted and erected its own version of Alamo Plaza signage.